Antonio supports his family with a much coveted job bicycling around the city to post flyers for American movies, and upon the bicycle’s theft the man and his son journey to reclaim it. 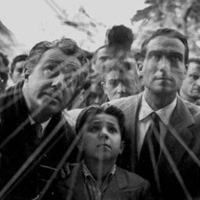 Shot soon after the second world war, Vittorio de Sica’s landmark is equally difficult to imagine seeing more than once and never having seen at all. Amid the rubble of a Roman Empire that has fallen yet again, everyone is scrambling to stay afloat, including Antonio who supports his family with a much coveted job bicycling around the city to post flyers for American movies. The bike might as well be made of gold, and when it’s stolen the father’s search to recover it—with his small son in tow—grows more desperate. On the simplest dramas flounder whole lives. Lamberto Maggiorani who plays Antonio worked in a factory and never had acted before De Sica cast him. The seven-year-old playing his son was watching the filming when the director noticed him and put him in the film (the boy would grow up to be a math teacher). Whether real actors could have managed in as devastating a fashion the final scene, in which hopelessness finally leads to a father’s disgrace and the sort of childhood revelation that constitutes a rubicon for coming of age, is open to question; over the years some have called Bicycle Thieves sentimental, and so it is if you consider the desolate stuff of fathers and sons emotionally trivial. This movie electrified the world, one of those rare films that raised the stakes of cinema forever, and within as few years as can be counted on one hand, an international critics poll named it the greatest picture ever made.